Packing FM, DAB and Internet radio, the Pure Sensia 200D Connect sits alongside the Pure Contour 200i Air on the Pure top table and takes on the likes of the Roberts ColourStream and the Magicbox Beam in the quest for radio touchscreen fun. 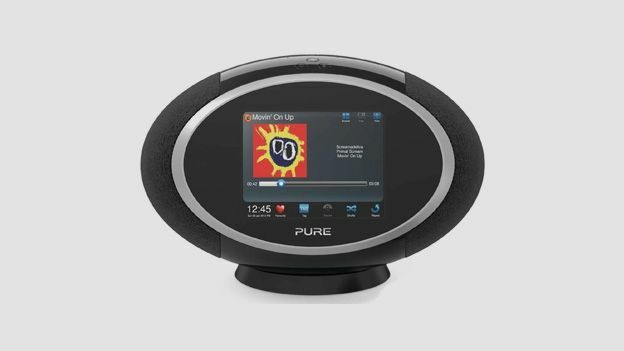 Looking exactly the same as its older brethren, the Pure Sensia 200D Connect is an odd looking rugby-ball shaped device that features a 5.7-inch touchscreen up front, stereo speakers on either side, four physical buttons on top (standby, volume up/down and mute), an aerial, and ports for power, headphones, aux-in and USB on the back. The capacitive touchscreen is obviously the USP of the 200D and we're delighted to say that it is a vastly improved one from the original, with a much better response to touch and a clearer display. Whereas the original Sensia's touchscreen frustrated and felt almost gimmicky, the new model's is a superb way of navigating through the plethora of on-screen options. Like the original, the Pure Sensia 200D Connect sits on a little plastic cradle, with slots that make it possible to adjust the display's angle and the setup also incorporates a funky little remote control, complete with a shiny red record button. We reviewed the black version, although a slick looking white model is also available. That record button will come in handy if you're looking to make use of one of the Pure Sensia 200D Connect's standout features – USB recording. You can instantly record radio that you're listening to (DAB or Internet) as well as scheduling future recordings – with three spaces on offer for recording your favourite daily or weekly shows. As well as that new addition you've all the ingredients that made the original Sensia a success, such as DAB radio, FM radio, Internet radio, podcast options, listen again features and apps. The Facebook app will scroll updates, pictures or whatever you want from your feed, the picture app turns the 200D into a digital picture frame and the weather and travel app is handy if you're using the new Sensia in your office. The UI is clear and simple to use and, while listening to radio or your own music collection, you are presented with album artwork, promotional images from the radio station and track information. There are also three different display options on board now – although we felt that the full-screen app option tested the mediocre pixel count to its limits. Fans of Pure Music are also taken care of, with access to Lounge accounts on board, and the ability to Tag tracks either using the touchscreen option or the dedicated button on the remote control. PureStream is the other killer addition to the setup. It's an Apple AirPlay like wireless technology that uses DLNA connectivity, combined with the free Pure Lounge app, to let you chuck your tunes over the airwaves to the 200D from your tablet or smartphone. On the app, which works with iOS and Android, you can access your stored music and, with a quick push of the P button, beam it over to the new Sensia. You are given the option to play music either from your Pure Music account or play music directly from your own library and we found it all to work pretty seamlessly. Pure has pumped some extra power into the 200D Connect's sound setup, offering 30W of output from the DSP tuned high efficiency class-D amplifiers and in-house custom designed full-range speakers. And while you're probably not going to want The Archers or The Today Show booming out at the top level, the deep and impressive sound is handy if you're looking to use the latest Sensia as a living room or bedroom speaker. A word of warning though – despite the ubiquitous features afforded to you by the 200D Connect, and the ever growing Pure ecosystem – the sound quality is nowhere near on a par with the likes of the Libratone Lounge, the B&W Zeppelin Air or even Pure's own Contour 200i Air. Yes, the Pure Sensia 200D Connect does offer a wealth of extra features compared to these standalone speaker systems but when you consider that you can use your smartphone or tablet to access a never-ending array of apps in which to beam over music to these setups, we're not sure that counts for much any longer. If you're looking for a multi-featured contemporary radio setup, and you would rather use your phone or tablet as an additional control option rather than the primary one, then look no further than the Pure Sensia 200D Connect. Yes, at a penny shy of £250, it's pretty expensive and yes, for that price you could nab a far superior standalone speaker setup, but the wealth of radio and streaming options on board the 200D Connect, combined with the easy to use touchscreen, makes it the standout device in a category that Pure is making its own.